Because Jerome Tiger’s career spanned only five years, there might be a tendency to speak of him as having been merely a promising young painter. He was much more than that. By the time of his death at age twenty-six, he was a fully developed mature artist at the height of his powers. He had innovated more, contributed more, and painted more magnificent paintings than many whose careers spanned several decades. He was born July 8, 1941, in Tahlequah, Oklahoma of Creek-Seminole heritage. He started drawing as a small boy, but unlike most other small boys, he kept at it. Drawing became a passion. The Indian artist expresses himself by projecting mind images. Salient features are captured but much else may be left out as irrelevant- foreground, background, perspective, and shading. Strong composition, use of line, and the instinctive use of color are all characteristics of Indian art. The attraction of good Indian art involves something far greater than ethnological interest; it deals with fundamental questions concerning the nature of man, his place in the order of things, and his relationship to unseen forces. These are universal concepts to which most people can respond. The viewer may not have the same background as the painter, and his life style may be based on a different set of attitudes, yet he can relate to and be moved by what is being expressed. Jerome Tiger’s technical virtuosity, phenomenal in one self-trained, certainly made him outstanding. Judging from the appreciative comments of many professional painters, Indian and non-Indian alike, he was a painter’s painter. Unlike many artists who must carefully work around their weak points, Jerome Tiger knew no technical limitations. He could set to paper with ease and facility the finest nuances, the most exquisite details and the most complex problems involving masses of moving figures. He could handle large murals as well as the smallest miniatures. This vast technical ability was used with unerring good taste. The trivial and mundane were always left out, heightening the expression of the essence. He was prolific, inspired, and painted often in the middle of the night, from strong inner- compulsion. He set high standards. He poured into each painting a full measure of artistry. Jerome Tiger’s technical ability had a great deal to do with the incredible demand for his works. Jerome Tiger’s works also appealed to many who were not particularly knowledgeable about art, Indian or otherwise. The reason was the extraordinary emotional appeal projected by his paintings. Tiger painted what he knew and felt deeply. One of his favorite people was his maternal grandfather. According to Jerome Tiger, his grandfather urged him to “put on paper what the Creek has in his heart!” He did just that. His people’s “Trail of Tears” was never far from his consciousness. There is nothing documentary about his paintings of the “Trail of Tears”. He does not portray an event but a mood. The oppression of a people, the cold, the deprivation, the waiting for the unknown, all this can be felt. He tapped the mainspring of Indian spiritual insight and shared an Indian view that the unseen is as real as the tangible. Death, a recurrent theme, was accepted gently with the affirmation that there is no death. He painted of man’s yearning for peace. He evoked sadness, loneliness, desperation, many moods. He painted the exultation and catharsis of violent action in his stickball scenes. He painted children, love, and divine guidance. Tiger’s paintings are of his people. They are sensitive portraits of real people, dancing, pulling on a pair of boots, cooking, hanging up the wash, drinking, working, gathering socially. Jerome Tiger was a traditional Indian painter because his innovations, which carried Indian painting to new heights, were in the spirit of Indian art. He felt a sense of obligation to that art and was always ready to help new artists who asked for help and advice. He would be pleased to know the profound influence he had on Indian art. “His influence is being felt wherever there is Indian painting. Jerome Tiger’s magnificent development has put new life in the Indian Art Movement. With his tragic death a genius was lost and a talent equal to none of it’s kind is gone. Jerome Tiger now belongs to the ages but his talent will live on forever.” From an article by Arthur Silberman. To mark the 50th anniversary of Jerome Tiger’s death, the National Cowboy and Western Heritage Museum in Oklahoma City has on exhibition through May 13, 2018, Life and Legacy: The Art of Jerome Tiger, an exhibition of 54 original paintings by the celebrated artist. 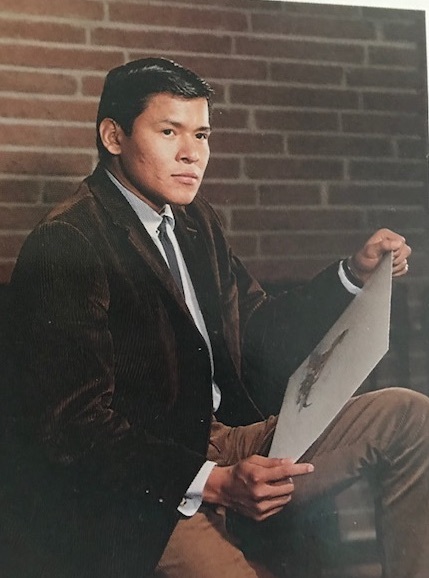 A Creek-Seminole painter born at Tahlequah on July 8, 1941, Jerome Tiger grew up near Eufaula, Oklahoma, and attended public schools in Eufaula and Muskogee. He dropped out of high school at sixteen and joined the U.S. Navy, serving in the Naval Reserve from 1958 to 1960. Finding employment as a laborer and sometime prizefighter, he continued to draw and paint in his spare time. He briefly attended the Cleveland Engineering Institute in Cleveland, Ohio, from 1963 to 1964. For the most part, however, he found formal schooling restrictive and frustrating.Encouraged by a friend, Nettie Wheeler of Muskogee, Tiger submitted several paintings in 1962 to the American Indian Artists Annual at Philbrook Art Museum in Tulsa. Recognition of his talent was immediate. Over the next five years he produced a large body of work that brought critical acclaim and a number of honors, including the All American Indian Days Grand Award in Sheridan, Wyoming, in 1965 and first prize in the National Exhibition of American Indian Art held in Oakland, California, the following year. Also in 1966 Tiger mounted a solo exhibition at Philbrook, a show that proved to be a sell-out with the public. Curator Jeanne Snodgrass asked the artist to replace items that had been sold on opening night. He is said to have replaced many of them twice before the show closed. Much of Jerome Tiger’s work was sold as quickly as he produced it and remains in private hands. Publicly he is represented in the collections of the Philbrook and Gilcrease museums in Tulsa, the Five Civilized Tribes Museum in Muskogee, Woolaroc Museum near Bartlesville, the Museum of New Mexico in Santa Fe, and the Museum of the American Indian and the Bureau of Indian Affairs, U.S. Department of the Interior, in Washington, D.C.